Steve, Jana and I had dinner last night with two of Jana’s great admirers, Rev. David Beckmann, president of Bread for the World, and Mike Troutman, our regional organizer for Bread. Jana’s relationship with Bread for the World goes back to her time as the assistant camp director for Highlands Presbyterian Camp in Allenspark, Colorado. One of her main duties was running the kitchen and feeding the hundreds of campers who came through in the summer and throughout the year. She turned the food program into an educational program for the campers so they could learn about hunger issues in the world. Bread for the World is a Christian advocacy group, lobbying our Congress on behalf of poor and hungry people in this country and around the world. For forty years they have proclaimed: Have faith. End hunger. Why? Moved by God’s grace in Jesus Christ, we reach out to our neighbors, whether they live in the next house, the next state, or the next continent. Jana heard this message and responded by using what she learned by reading scripture to teach others. And she led me in this way also. One of the main things Bread does is advocate; they lobby Congress on behalf of others who have no voice or whose voices have been marginalized. After Jana’s accident in 1983, she lost the ability to communicate clearly by speaking. When God sent her to Washington, D.C., in 1994 to be a voice for the voiceless, she needed an Aaron. Moses’s excuse to God for not leading the people out of Egypt was that he was no public speaker. So God provided his brother, Aaron, to be his voice. So I assumed the identity of Aaron, the public speaker. Being the shy, introverted type, (I’m not joking here. That is who I am. I have had to learn to be otherwise.) this was not an easy task for me. But together, Jana and I lobbied our then Senators Kerry and Exon, and Peter Hoagland, the second district rep in 1994 on the campaign, “Many Neighbors, One Earth.” It was all about sustainable development. We walked the halls of Congress and even got to ride the train underneath the capitol that whisks people back and forth among the congressional buildings. It was the most amazing experience I ever had. And for the first time as a citizen of the United States, I understood more about our government and my role in it than I ever gained from A.P. U.S. history in high school. I was hooked! We have been back many times, raising our voices. And though we were not often successful with our legislators, Bread has had a huge impact on these issues in their forty years of work. And these men are admirers of my sister Jana because her life is the proof of that statement. God called Jana into place that was impossible for her to go. But walking with him, everything has been possible for Jana. She has put her time and her treasure and her heart into these issues for over thirty years. She can’t walk the halls anymore as her body is so weak. But her fingers are still strong! She is still writing letters and emails, explaining why effecting good policy will change things for the better for everybody. She is yeast in the dough. Bread rising. Give us this day the bread that doesn’t run out. And that is the mission of Bread for the World. Working together in the act of loving God by loving our neighbor, we can make sure that everyone gets this bread. 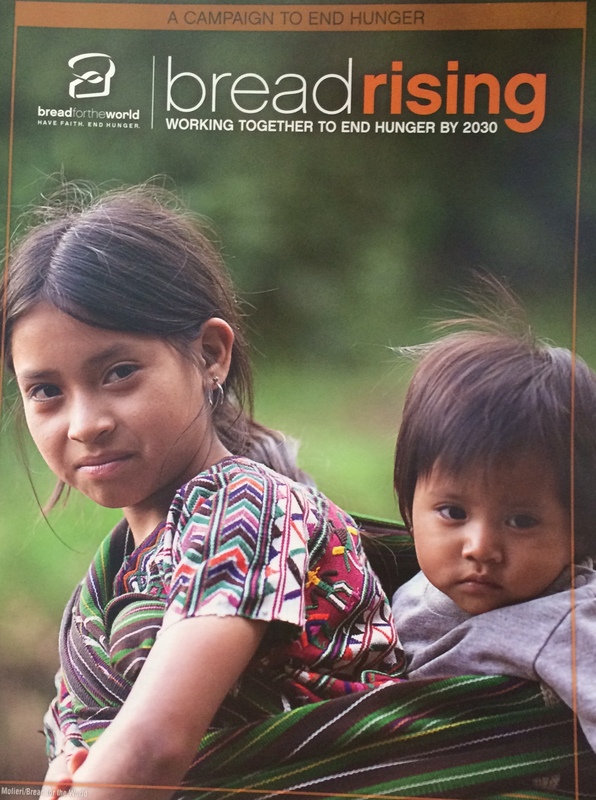 We can end hunger by 2030.